365 Fashion and Lifestyle: THE SHAPE OF THINGS TO COME. PETER PILOTTO FALL WINTER 2016. THE SHAPE OF THINGS TO COME. PETER PILOTTO FALL WINTER 2016. If some of the designers are concerned about maintaining a sense of individuality in these turbulent times, Peter Pilotto and Christopher De Vos don't seem to have that problem. Gifted beyond normal when it comes to coloring, printing layering and embroidery, they remained true to the core of the Peter Pilotto label and for Fall Winter 2016, they set a new fashion landscape in their usual terms. 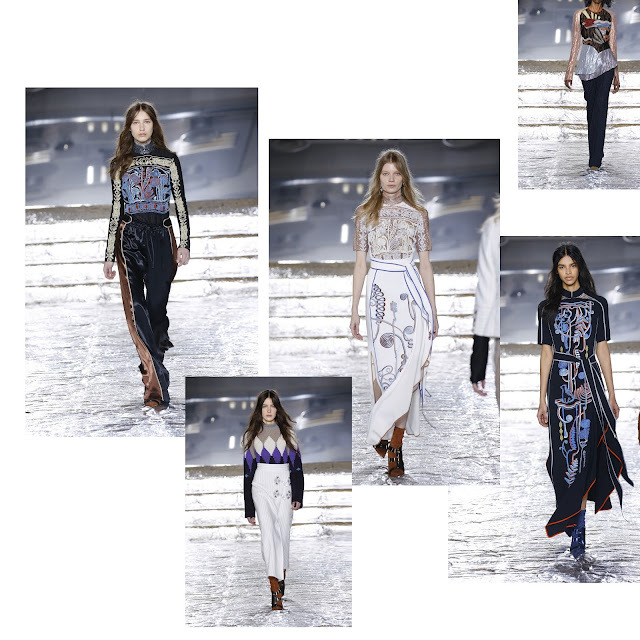 So, what is the Peter Pilotto woman going to wear next season according to the two masters? Painted coats, pointed suede sock boots, long sleeved dresses that explore the drape of circular pattern work, tailored pant suits and cocktails gowns, all embed with glinting Swarovski adornments and patchwork of thread embroideries.